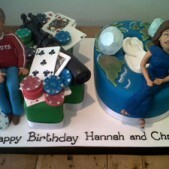 For a special milestone in your life, why not celebrate with a bespoke number birthday cake? Cakes by Robin are experts at creating adult birthday cakes that are as delicious as they are delightful – and traditional number birthday cakes are a perfect way to mark that special occasion. Whether you choose from one of our 2D transfer cakes or have a 3D handcrafted number made especially for you, our professional cake designing team will use nothing but the finest, freshest ingredients to create a birthday cake that you will love. What’s more, we can personalise and decorate your numbered birthday cake to reflect your style, hobbies and special interests, making it truly all yours! Take a look at our Number Gallery below to view some examples of the beautiful designer number birthday cakes we’ve had the privilege to create for our clients over the years. Robin and her team of expert bakers and cake decorators have many years’ experience in designing stunning creations for every occasion. As a London cake company with a reputation for creativity and originality, we believe we can cater for every birthday cake requirement. Choose from a wide range of delicious Flavours and Fillings including Chocolate Fudge, Coffee & Walnut and Red Velvet. If you have a special dietary requirement – no problem. At Cakes by Robin, we can cater for all your needs, including Gluten Free numbered birthday cakes, making sure that no-one has to miss out on a heavenly slice of birthday cake because of a food intolerance, sensitivity or allergy. 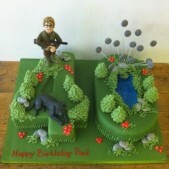 All our cakes are made by hand to your specifications. 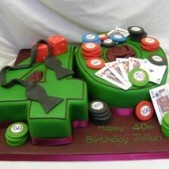 The price of your number cake will depend on the exact choice and complexity of the design. Please feel free to speak to us regarding your budget. We design all our numbered birthday cakes to order in our studio in South West London and can deliver your cake to you direct. 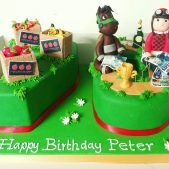 Delivery within the London area is free; please visit our Cake Delivery page for full information about cake delivery. So give us a call and take the opportunity to discuss your ideas for a bespoke number birthday cake with one of our professional cake designers. We look forward to meeting you.